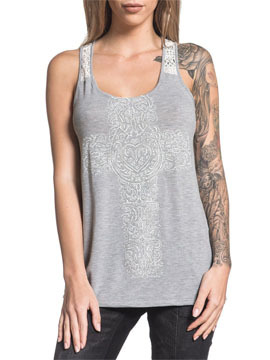 Sinful Dusty Wrangler womens scoop neck tank top features a large floral filigree cross, heart and horseshoe embellished with dozens of rhinestones in the center. White lace panels sewn on straps and back. No graphics on back. Lava wash for distressed and vintage look, 50% cotton 50% polyester,, light weight, slim fit. Garment dyed with silicon wash for soft feel. Color: heather grey..